In 155 games last season, DJ LeMahieu hit eight home runs. 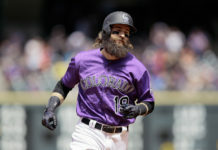 In only 14 games this season, the Rockies’ All-Star second baseman already has half that number after pounding a home run in the game’s first at-bat and another in the sixth inning. 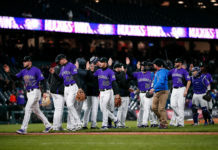 LeMahieu, hitting leadoff on Thursday in place of the injured Charlie Blackmon, drove in four runs on the evening to provide most of the Rockies’ offense in their series-opening victory over the Washington Nationals. Starting pitcher Chad Bettis, who at this time last year was recovering from cancer, twirled seven solid innings while working around the dangerous Nationals lineup. 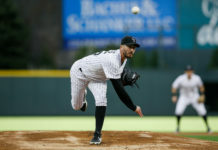 Bettis allowed only three hits and walked a pair of batters while striking out five, and relievers Bryan Shaw and Jake McGee made the Rockies’ early lead stand up. McGee had a perfect ninth inning, retiring Anthony Rendon, Bryce Harper and Ryan Zimmerman — the Nationals’ 2-3-4 hitters — in order. The Nationals collected only four hits all game, their lone run coming off the bat of second baseman Howie Kendrick, who homered off of Bettis in the fifth. Harper, in particular, was visibly frustrated by Rockies’ pitching, striking out twice against Bettis and looking foolish while whiffing at a McGee pitch in the final frame. 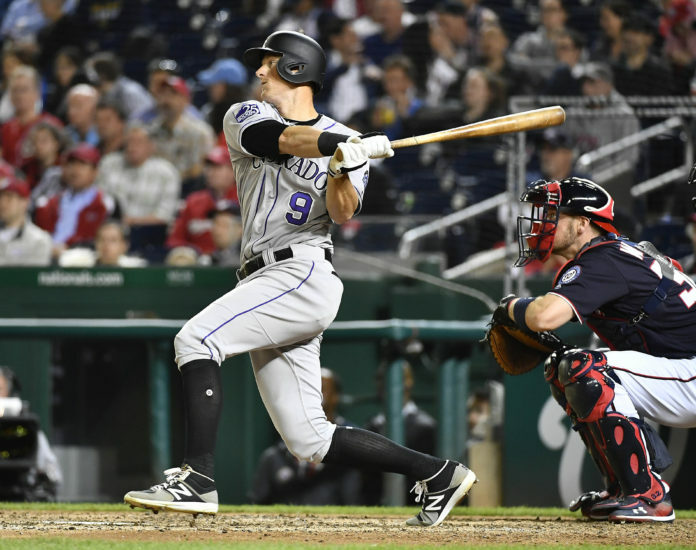 Washington starter Gio Gonzalez was solid after surrendering the leadoff homer to LeMahieu, allowing only one more run in five innings while striking out seven Rockies. Without Blackmon, the Rockies’ offense has sputtered. On Thursday, the 4-5-6-7 hitters in their lineup — Trevor Story, Ian Desmond, Carlos Gonzalez and Pat Valaika — combined to go 1-for-17 with no runs, no RBI, no walks and seven strikeouts as manager Bud Black tries to find a lineup that clicks. Valaika, miscast as a first baseman, stands out as an oddity, and watching Desmond patrol center field was equally peculiar. On the season, the Rockies are batting a woeful .233 as a team and have struck out 132 times in 14 games — a .282 strikeout percentage. The Rockies, now at 7-7, look to climb above .500 for the first time this season on Friday night. Colorado native Kyle Freeland (0-2, 5.56) will look for his first win of the season; Washington’s Tanner Roark (1-0, 4.50) will oppose him.